In my quest to strike a nice balance between being informative but not reading too much like a guidebook (which are not THAT fun to read unless you’re a real travel geek), I am going to try using a “Practical Info” section at the bottom to cover some nuts and bolts and more details on accommodations etc. 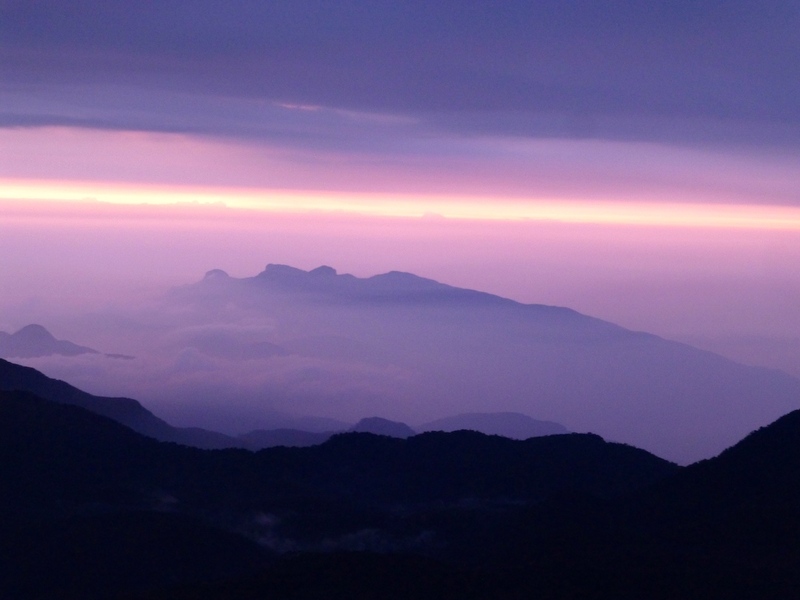 Highlights of the trip were Adam’s Peak, Mirissa and Yapahuwa. Lowlights were Pinnawala, Anuradhapura and our first driver. Sri Lanka’s long civil war ended (controversially, as you may have heard in the news as recently as the Commonwealth Summit last month) in 2009, and its tourist star is on the rise. 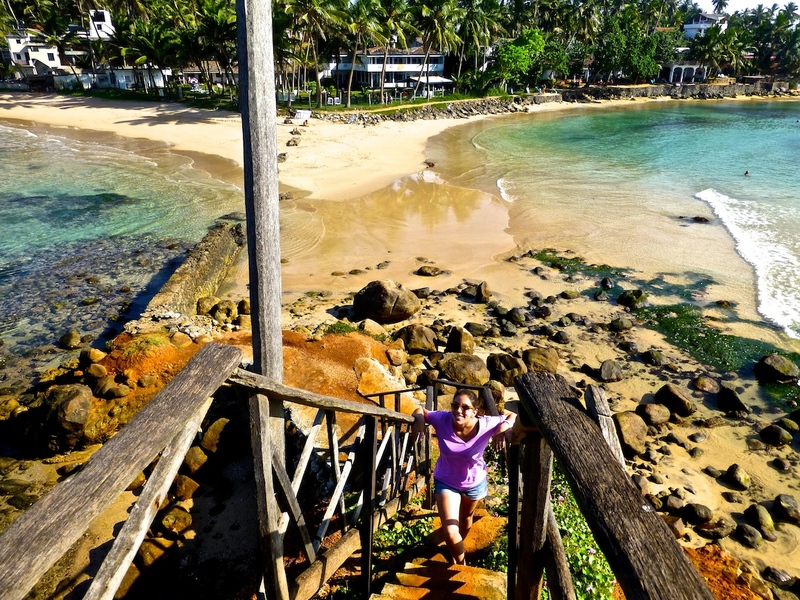 This is a fantastically colorful island with a rich Buddhist heritage, historical sites, spice and tea plantations, beautiful hill country, wildlife parks, nice tropical beaches and smiling locals. I remember nothing from my 1981 visit and was excited to return at long last. My eyes were opened to Sri Lanka’s peculiarities and at the same time I was reminded of many characteristics shared by developing nations. The way so many more interactions and services take place in plain sight. You might see a guy repairing his engine on the side of the road instead of enclosed in some workshop set back from the street. And there is just so much more activity on the road with tuk-tuks, mopeds, bikes, buses, cars, dogs and pedestrians. The way five minutes often means 30 and there is time aplenty for sitting and chatting, but on the road a wasted second is worse than a sharp stick in the eye. Yet at the same time I never saw even a hint of road rage. You over-extended yourself on a pass and will crash horribly if I don’t let you back in to the lane? No problem, I will come to a virtual stop and not even honk. On a related note, as we were leaving Kandy a moped rammed into and dented a van and the reaction of the owner and everyone around was so calm. It was heart-warming to see such poise and respect. Nobody seemed perturbed in the slightest when we took pictures of them. I was reminded how the manual transmission redline is treated as 3k RPM and not 6k, with upshifts often taking place below 2k RPM so someone is driving less than 10 miles per hour in third gear. And I thought a lot about how often we equate GDP with comfort and happiness. Sri Lanka has GDP per capita of less than $3k vs. the US at about $50k. But we saw so little evident poverty or discontent. If you live in a village with tropical fruit, fresh fish, a cohesive family and lack of conflict, is GDP that big a determinant of your well-being? Did I mention how colorful Sri Lanka is? That was probably what struck me most about this island. It is green everywhere and we saw countless rice fields, palm trees and tea plantations. 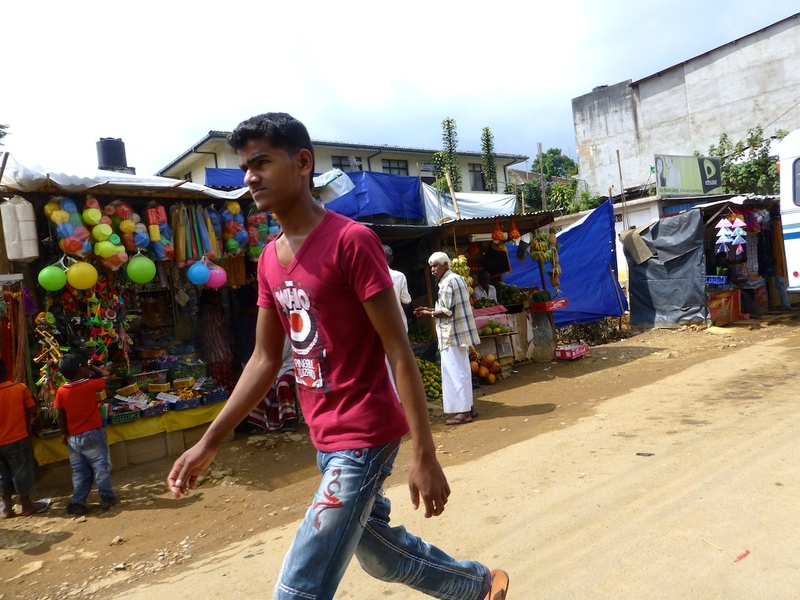 Between the tuk-tuks, saris, buses, boats, signs, doors, shacks and fruits the colors were just so tremendously vibrant. About the only white we saw was the clothing worn by Buddhist worshippers and white sheets hanging across the road to signify a funeral. The first night we stayed at Amaya Chalet which is about 20 minutes from the airport and not near much. Note that the airport is a good bit outside Colombo, so depending on what direction you are headed, you would be well-advised to do some research on your hotel’s location…lest you find out you booked an hour each way in the wrong direction. On Monday we did a quick little tour of Negombo before heading inland. The Negombo Lagoon area had a lot of colorful small fishing boats. We briefly perused the fish market which had some large specimens like mahi and what appeared to be a baby hammerhead shark. On the sand were guys drying out fish on mats. The Dutch built a lot of canals in and around Negombo, and there are many Christians in the area. While on that topic, Sri Lanka is mainly Buddhist but Hinduism, Islam and Christianity are significant. There seems to be general religious harmony here. From Negombo we drove a long way on bumpy back roads to the Pinnawala elephant orphanage, stopping nearby for some roadside juice and flesh of the ubiquitous, orange king coconut. I had read mixed reviews of the orphanage but we thought it was on the way (not so much given the roads) and seeing lots of elephants seemed like a good idea. Unless this is your only chance to see elephants or perhaps you have small children, I would skip it. They charge Rs 2500 (nearly US$20) for admission, which seemed steep for this part of the world, and then aggressively try to up-sell you on everything inside. 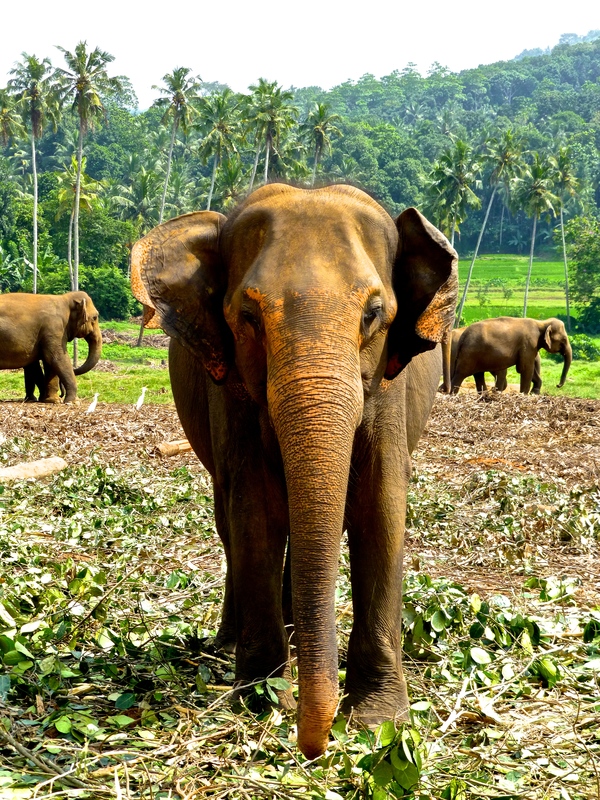 Want to feed an elephant? Extra Rs 200, please. What is worse, though, is that it was impossible to tell who worked there and was offering a legitimate extra and who was just trying to scam you. And the workers were generally not warm. Most of the elephants are in chains, and who knows but one looked sort of drugged to us. The vibe was angry and depressing, just the opposite of what I wanted. It was exciting to feed an elephant, though. You just put fruit in its mouth, like a banana with its peel or pineapple with its skin, and when it breathed on me it felt like walking past one of those industrial vents on a New York sidewalk. Lunch at Hotel Elephant Park was quite good and we had a front-row table to view the 2 pm bathing of the elephants in the wide, mild rapid river below. This was our first proper meal and it is quite a spread. Sri Lanka is famous for rice and curry, so I ordered fish and Jenni prawn. They brought a huge plate of rice and we each got a small bowl of our respective protein curry, but they also brought several more bowls with things like dhal, mango chutney, wonton shaped crisps and roasted pumpkin. At dinner that night Jenni made an astute observation. If you order one meal to split, you get almost the same meal as if you order two…just without one curry bowl and for half the price. 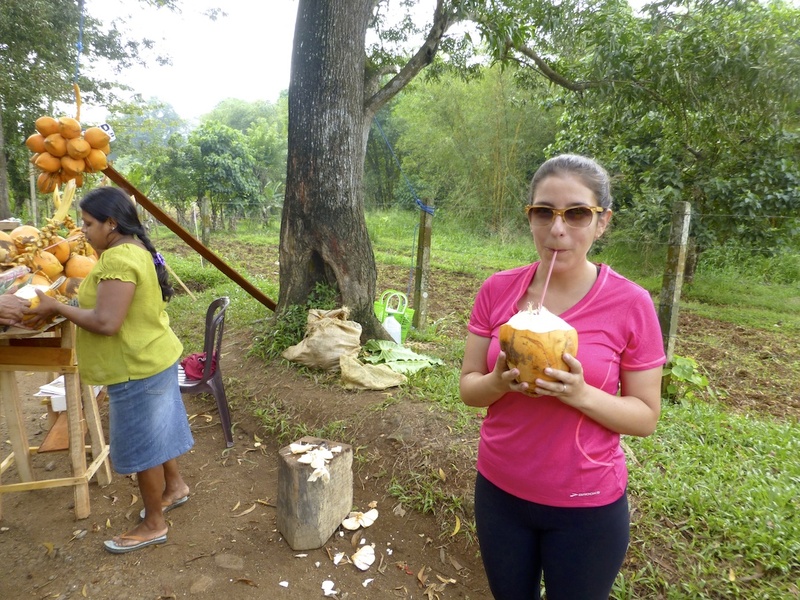 In general I thought the food in Sri Lanka was quite good, and I was shocked at how mild it was. There was spice, but nowhere near the level I expected. Our waiter misunderstood and thought we said the food was too spicy instead of not enough. I think they assume white foreigners have no tolerance for spice. Perhaps Americans in general like spice more because we normally eat ethnic food like Mexican or Indian, whereas say if you are Russian or French then you do not normally eat spicy food? After lunch by the elephants we had our first of two little spice garden tours. Sri Lanka is rich in fruits and spices and we saw clove, vanilla, citronella, a peculiar pineapple variety, ginger, turmeric and more. We continued north to Yapahuwa, which was awesome. It was briefly the capital several hundred years ago and at one time home to the Sacred Tooth Relic of the Buddha. At 5 pm we were the only ones there aside from a worker or two and a couple monks. The stone steps ascending the face were steep and narrow, followed by a trail going up and to the side and then rocky ground towards the top. There were many toque macaques (reddish-brown monkeys with hilarious hairdos that Jenni dubbed the bad toupee monkeys) and splendid views over the plains below with rice fields, palm trees, smoke stacks and mountainous outcrops. It was near sunset when we descended and got a five-minute private tour of the cave temple with some paintings and a bronze buddha from several hundred years ago. Oh, and by smoke stacks I mean not the hideous industrial type but the little plumes of smoke rising from the waste fires that are so common in the tropics. It cost Rs 1000 and came with a bottle of water. Monday night we stayed at Milano Tourist Rest in Anuradhapura. Dinner was fine but not as good as Lonely Planet hyped it, and thankfully we did not get hit by any of the mangos falling from trees in the charming front courtyard. By the way, Lonely Planet was surprisingly wrong on several matters which partly caused us to miss seeing a dance in Kandy. To punish them we went with the Rough Guide for India. Tuesday we got more cheap breakfast pastries at Family Baker, and I am definitely digging the $1 for two person tasty breakfasts. My seeni sambol had a nice little kick to it. These bakery shops are very popular with locals. And next door at Family Grocer, a 5L jug of water was only Rs 150! I love my water and at times whispered sweet nothings to this new stout comrade. 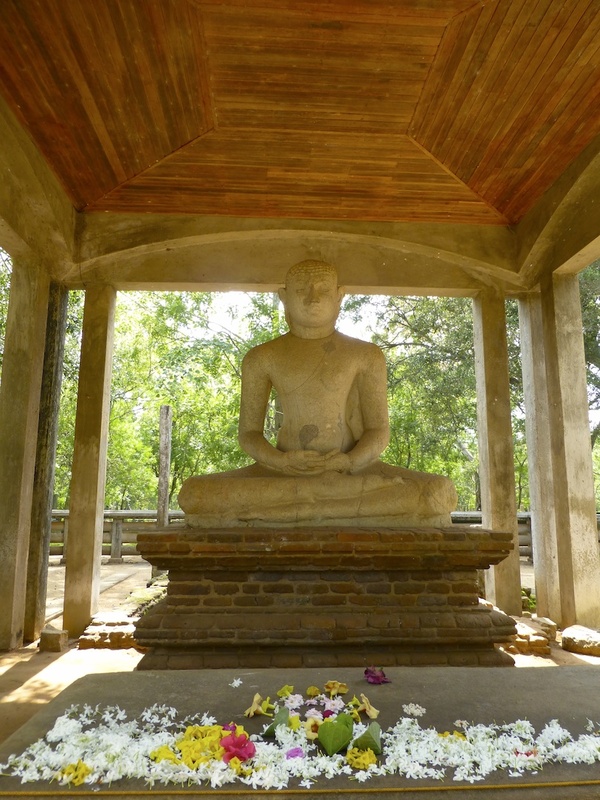 We were somewhat severely underwhelmed by the ancient Anuradhapura sites. Perhaps our expectations were off, or we are spoiled from Angkor Wat and lots of other magnificent sites. There is much historical significance to the area which was the first capital and birthplace of Buddhism in this country, but we did not find it all that beautiful or interesting. It cost Rs 3250 to enter and with that you do not get any sort of map or explanation how to tackle the spread out ruins, museums and dagobas. There were monkeys, though, and monkeys make everything better. If you are really into Buddhism and/or history then you might find this a worthwhile visit, but we would skip it. It was funny, though, to see Jenni in her pink neon shirt while most of the visitors wore all white, and the first place we stopped was the famous Sri Maha Bodhi but due to our sub-optimal driver/guide we did not know this until we had left. The Sri Maha Bodhi is considered the oldest historically documented tree in the world. Due to our disappointment with Anuradhapura and desire to reduce drive time and enjoy our splurge at Hotel Sigiriya, we bagged Polonnaruwa. This is considered one of the top Cultural Triangle attractions and perhaps we would have enjoyed it more. Alternatively we could have tried a jungle safari at Kaudulla or Minneriya National Parks, but we needed a little rest. 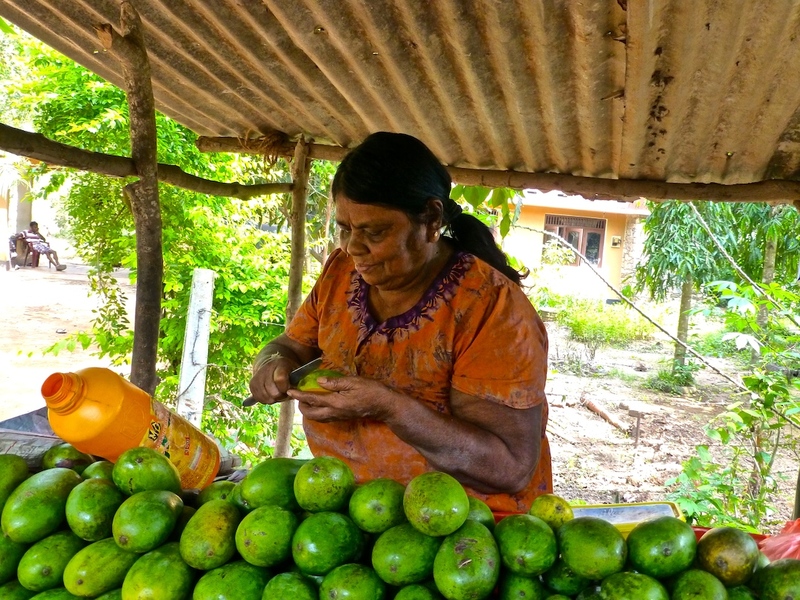 The woman running the roadside stand where we got mangoes was cute. She was excited to have her picture taken with us and then wanted to see it, so she grabbed the camera by the lens to admire it. Needing a bit more sustenance and seeking an authentic and spicy lunch, we dined at a roadside spot where there was a little buffet. Jenni was the only female and I ate with my hands, like the locals do. Not so easy to eat rice soaked in dhal with no utensils. One of the dishes was spicy but only because there were lots of chopped green peppers in there. To me it doesn’t really count if I can pick out the spice. I could serve a magret de canard avec beaucoup de chili peppers on the plate but that doesn’t make it spicy food. Arriving at Hotel Sigiriya we were greeted with cold towels and fresh wood apple juice. 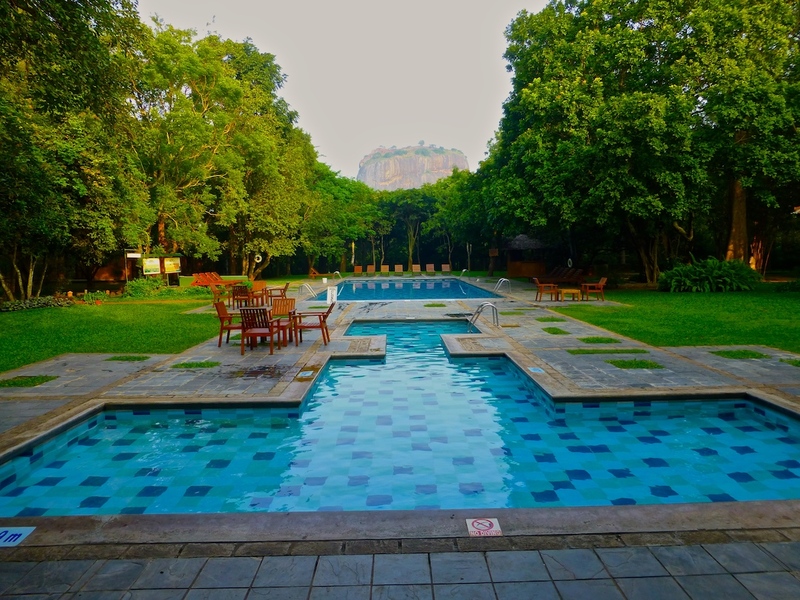 The lobby offers wonderful views over the nice pool to the rock of Sigiriya, considered the premier site of the Cultural Triangle. It was pretty hot and humid everywhere but Adam’s Peak so a dip in the pool was mighty refreshing. 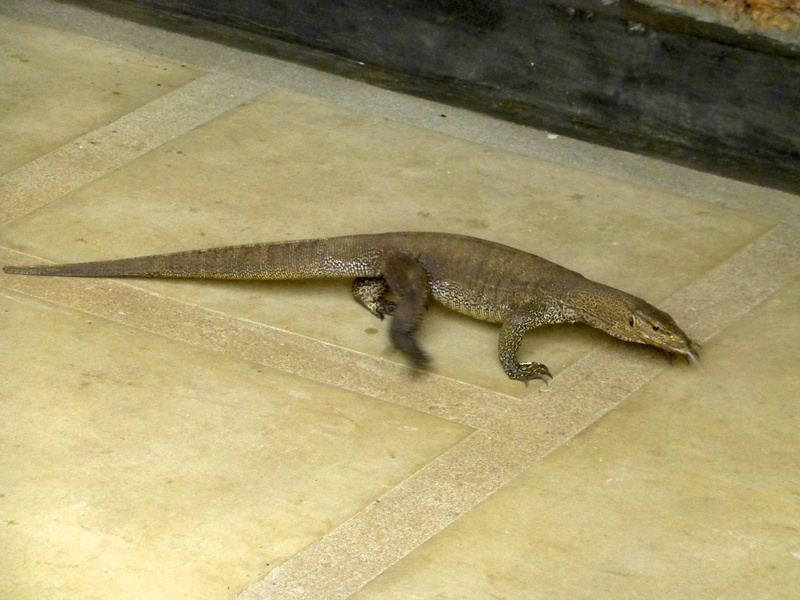 And this huge lizard walking by the rooms looked like a baby Komodo dragon. On Wednesday morning it took half an hour for us to walk from our hotel and grab tickets (Rs 3900, cash only as with most places) to Sigiriya. There are dogs everywhere in Sri Lanka. They hang out all along the streets and even lie down in the road. It is remarkable how rarely they seem to get hit by cars because they do not even move quickly to get out of the way. On this walk Jenni held the first puppy of what I am sure will be many. 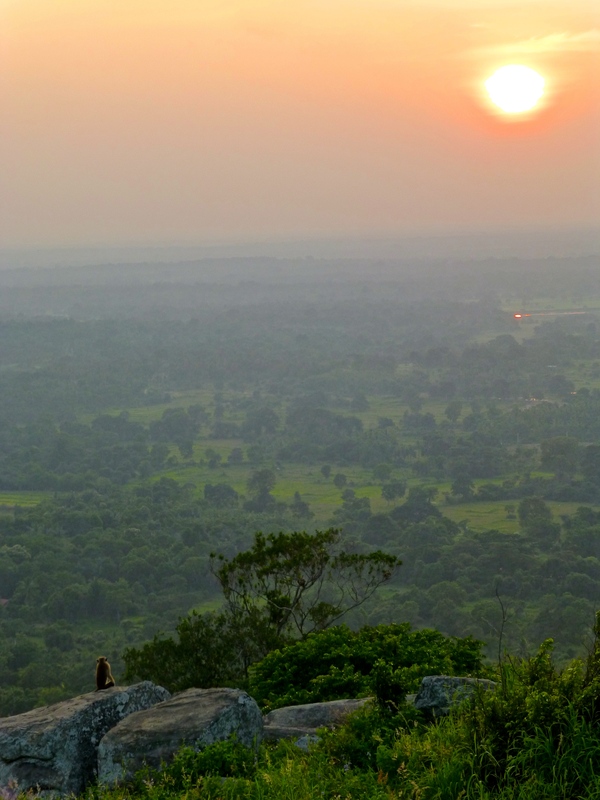 At Sigiriya the activity is a climb to the top on narrow stairways, with a brief diversion on the way to see ancient cave paintings. It was neat and we enjoyed the views from the top. Plus we saw a couple snakes, some weird squirrel looking creature, a dog with a litter of puppies and tons of monkeys. Our whole time here we did not encounter any aggressive or scary monkeys, which was refreshing. Unlike, say, Cambodia or Bali where a monkey might jump on you or try to steal your bag. It took less than two hours to ascend and return with plenty of time to enjoy the views. While Sigiriya was very nice, I was generally disappointed with the prices charged to visit the cultural sites and the value received. I felt as though the government is looking to take advantage of tourists rather than build a lasting relationship. With the cost of living what it is, paying US$60 for two to enter Sigiriya and getting no information or maps is somewhat offensive. I am not saying this is apples to apples, but I am writing from India and in Kochi it cost the two of us about 16 cents to enter some sites. After Sigiriya we drove to Kandy and stopped on the way at the wholesale fruit market which was very cool to see, and then snapped a few shots of the huge (modern) Buddha at Dambulla. We also visited the Ranweli Spice Garden in Matale for a tour with pressure to buy product. The prices were absurd but the tour was neat. They are very into Ayurvedic medicine in Sri Lanka, and I imagine there are some great benefits. We arrived in Kandy at 4:45 and soon reached the nadir of our relationship with our driver. I won’t bore you with all the details because I know that nobody wants to listen to someone traveling the world whine, but basically we really wanted to see the famous nightly Kandyan dance performance and missed it because of our driver. So instead we drove around a little and did see some nice nighttime views of the lake and city from the hills above it. Thursday morning I decided to pull the trigger and cancel our driver mid-trip. He and his boss reacted admirably well and we struck a fair deal. While I was nervous this could cause a confrontation, it was absolutely the right move and our trip got so much better with the albatross released. I am reading The 4-Hour Workweek and Tim has a theory that success can be measured in the number of uncomfortable conversations you’re willing to have. I hope he is right. The fish and meat market in Kandy merits 5-10 minutes, and when we stopped into the Queen’s Hotel to inquire about a new driver we were fortunate to witness a Sri Lankan wedding and at least got to see a brief display of some Kandyan dancing and music. The Temple of the Sacred Tooth is undoubtedly the most famous attraction in Kandy. While you don’t actually get to see the tooth, there are some lovely buildings and museums and I found it far more interesting than the historic sites because of the glimpse it offers into present day life. There were hundreds of Sri Lankans and everyone is herded like cattle up some stairs for a 10-15 second glimpse through an opening into a room where allegedly the Buddha’s tooth is hiding behind protection. At many places long shorts seemed fine, but here pants are required. And security is pretty tight after an attack several years ago. We enjoyed our lunch at Devon Cafe which had an extensive menu and really cheap prices. Jenni’s vegetable curry with rice cost $1. The attached bakery was packed. We did not have much time in Kandy but other activities nearby include the Peradeniya Botanical Gardens, Kandy Garrison Cemetery, trekking in the Knuckles Range and Udawattakelle Sanctuary. Traffic getting out of Kandy was brutal but we made it to Adam’s Peak in about three hours, not so bad. The last 37 km are on narrow, bumpy mountain roads with two-way traffic. It is quite impressive that public buses pass each other on these roads. We saw a few monkeys on the drive but no more during our brief stay in hill country. As we neared our hotel we could see Adam’s Peak and its steep, triangular top is quite imposing. After seeing how beautiful the hill country is with its tea plantations, red soil, rivers and waterfalls, I wished we had spent a little more time here. 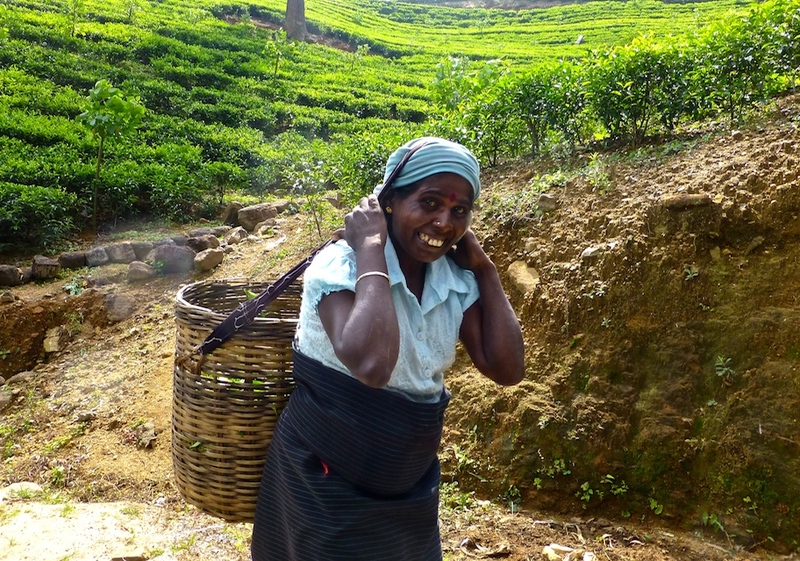 The weather was cool, there were pine forests and eucalyptus groves, green trees bursting with red flowers, and women carrying baskets full of tea leaves with straps on their heads. I did not research accommodation beyond where we stayed, but when driving away I noticed Bogawantalawa was a lovely area. Hiking Adam’s Peak was perhaps my favorite activity in Sri Lanka. Pretty much everyone wakes up in the middle of night to summit for sunrise. I believe the “season” runs from December full moon until May full moon, so we just missed it by a few days. In-season there are lots of religious pilgrims, all the tea houses lining the path to the top are open and I think the whole path is lit. We spent Thursday night at the Slightly Chilled Guest House which is a 10-minute walk from the trailhead. I liked this place a lot. After many dubious time estimates over the preceding several days, we decided to wake at 1:40 am and leave the hotel with our guide at 2 am. Since it is pitch black there is not much reason to stop along the way except for exhaustion. The trail ascends gradually for a while with and without steps, passing a few open tea houses where one could buy water and snacks. Then the steep stairs begin, and end only at the top. I had a hard time finding accurate stats, but I think the trail is a little more than 3 miles and ascends more than 3k vertical feet. It is fairly grueling but we were mentally prepared for worse. The sunrise views were wonderful with other mountains in the distance, a lake below and a cliffside waterfall. The Buddhist temple at the top opened around 6 am (I think you only get to see Buddha’s footprint in-season). We paid Rs 2000 for the guide. You do not need a guide, and I think in-season this is especially so given the lights and traffic. But we felt it was money well spent since it removed any additional stress beyond hearing our alarm at 1:35 am, and he led us to an uncrowded and better vantage point for sunrise. (From the top, descend the Hatton trail perhaps 10-20 steps and then climb up on the ledge on the left hand side.) If you do this hike, bring a headlamp and layers for the top, and some salty food or electrolyte tablets because you will sweat a lot. The way down was faster but with quivering quads and quaking calves (it took us 2 hours 15 minutes to ascend and 1 hour 35 minutes to descend the trail). I really liked how we got to experience the trail in the dark as well as the light. And while we may have missed out in some ways by doing this hike off-season, the upside is that it was not crowded at all. Near the end Jenni made friends with Vindu, we met a nice Aussie couple at breakfast back at the hotel and then we were on our way to the beach! 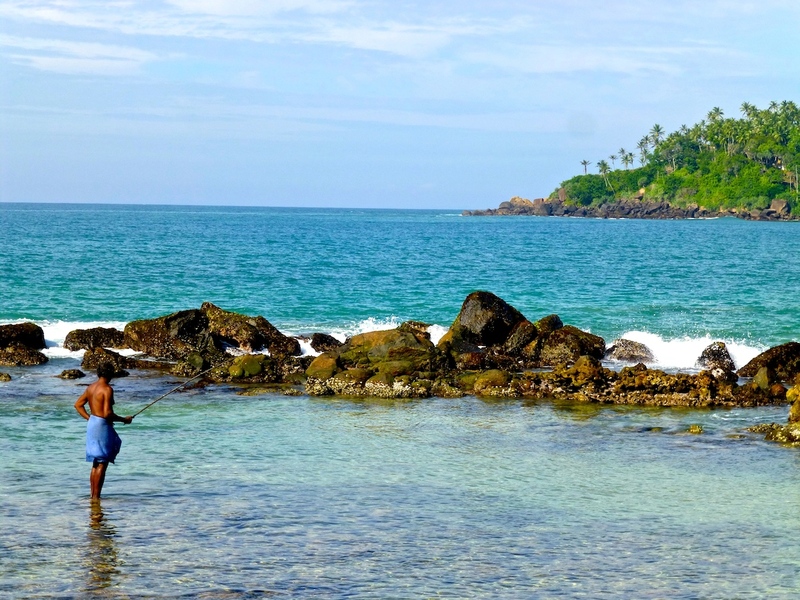 There are lots of beach towns in Sri Lanka, and after a little research we chose Mirissa. 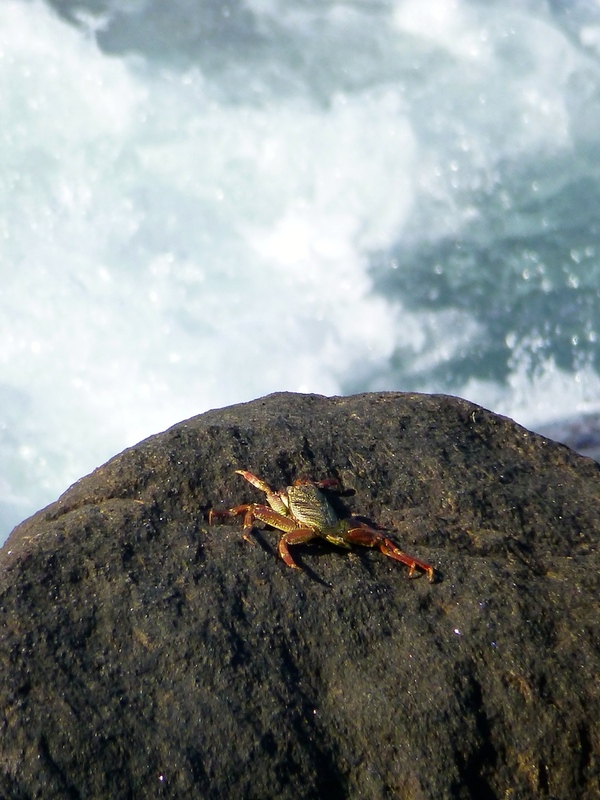 It is maybe 45-60 minutes from Galle Fort, a top attraction that we missed. 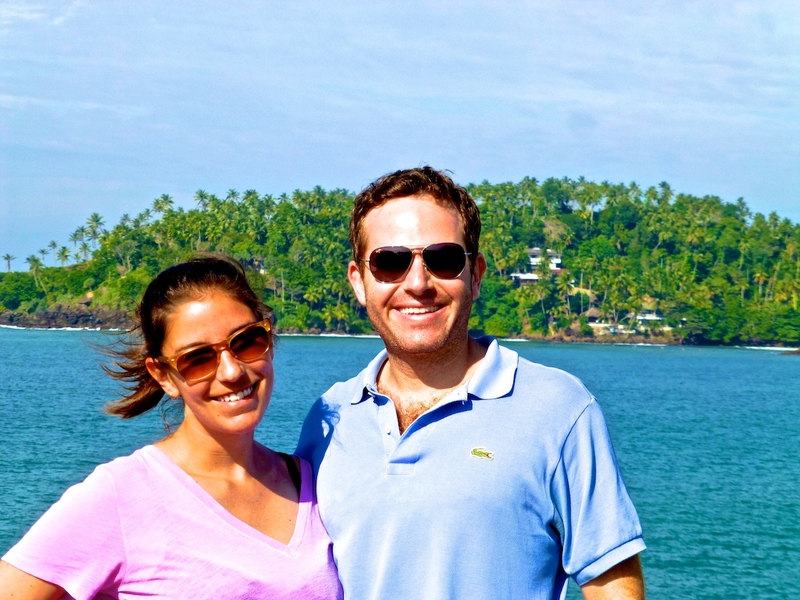 It is also near Unawatuna, a more popular beach town that we read had become just a bit too developed. Approaching from the road, glimpses of the ocean are rare and the area is uninspiring. But after passing through the gate of Palm Villa, our worries disappeared and stresses melted away. Ah, our first of many tropical beaches to visit on this voyage. We loved this place. The first evening near sunset there were a bunch of Sri Lankan boys playing cricket on the beach. For about US$60 we had an oceanfront room. Our hotel was small and charming with a welcoming owner. It is perched a handful of feet above the sand and its location means that very few non-guests cross in front, thus giving the feel of a private beach with larger bays on either side. The water was warm yet still refreshing. Mirissa is a popular whale watching spot, but after moving around so much and hiking Adam’s Peak we did little but relax. There were quite a few surfers, and the bay immediately west had several beachfront restaurants and bars, usually playing reggae. We had lunch one day at a place that seemed to be called Surf Bar, near the western end of this bay. Some of the places have parties on specific nights, but we be acting all old on this trip for the most part. Active where possible, but minimal drinking and partying. I know my mom will be elated to read this. We ate most of our meals at the hotel and the food was solid. Life is good when your diet is rich in tropical fruit and fresh fish. Breakfast each day was enormous, with a plate of papaya, mango, pineapple and banana followed by eggs and about six pieces of toast. Jenni got the traditional breakfast of string hoppers with multiple curries and coconut sambal one morning and it easily could have fed three. Banana juice or banana lassi was perhaps our most difficult decision here. 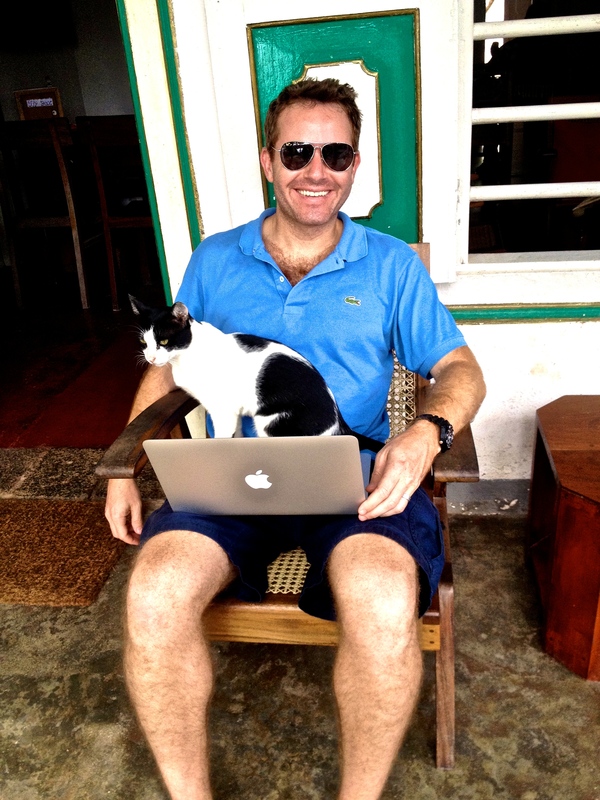 Overall we had some really enjoyable experiences in Sri Lanka though I cannot say I loved it. It reminded me that it can be difficult to distinguish a destination from one’s experience there. Sometimes a trip just clicks and you get all the good bounces. Other times this is not the case. I think it is helpful to take guidebook recommendations or personal advice with a grain of salt because it is exceedingly challenging, at times nigh impossible, to evaluate something independent of the specific experience you had there. The kind smile or cold response from a stranger on the street can transform one’s enjoyment. Sri Lanka has a lot going for it and my guess is that it will continue to gain in popularity as it recovers from years of war. The exchange rate was about 130 Sri Lankan Rupees per 1 US Dollar. We got visas on arrival for $35 each and it was quick and painless. It is probably better to use the online system as I think it costs less and the line was growing by the time we finished…and this was 1:30 am so I can imagine it might be bad at busier times. There are ATMs at the airport and in larger towns and cities. Communication: At the airport we bought a Rs 1300 SIM card from Dialog. It did not work on my iPhone 4S but that must be a Verizon/Alan issue because it works fine on Jenni’s AT&T iPhone 4S. Calls to the US are crystal clear. That got us Rs 850 of credit and it costs Rs 6/minute to call the US, plus we get 1.5GB of data. It is amazing how inexpensive mobile usage has become. Oh, and a good tip: bring something like an SD card case to store your other SIM. WiFi was widely available. Transport: We hired a driver, and this seemed like just about the only option given how much we tried to cram into several days. I suppose we could have taken some public transportation mixed with taxis and local tuk-tuks. There are loads of buses but they looked real crowded and we have little rolling duffels that would have been tough. Some trains exist and I think the Colombo/Kandy route is particularly well established. The roads move quite slowly so it takes longer to get anywhere than you would guess by looking at a map. Though there is a new highway so getting from Mirissa to the airport took only 2.5 hours (it was a holiday which may have helped). Sri Lanka has plans to improve its infrastructure and add more fast roads, and the second international airport (Mattala Rajapaska) opened recently on the southeast part of the island. To find a driver, I requested several quotes from tour agencies or hotels we had booked. These were typically in the range of $550-600 total for our trip. We chose Menaka Arangala, who I found on Lonely Planet’s thorntree forum. Unfortunately, I cannot recommend you do the same. While his price was noticeably lower than others ($420), he assigned one of his associates and after telling us we would be in a Prius gave us a slow, diesel mini-van. Mr. Siril turned out to be a real downer. He was that lovely mix of incompetent and dishonest lacking a side of humility. If you do hire a driver and you are cost conscious, consider asking if hotels you book offer free driver accommodation because if not you will have to pay your driver more. This entry was posted in Asia, Sri Lanka, Uncategorized and tagged Adam's Peak, Anuradhapura, Kandy, Mirissa, Negombo, Pinnawala, Sigiriya, Sri Lanka, Yapahuwa on December 21, 2013 by aleavitt77.